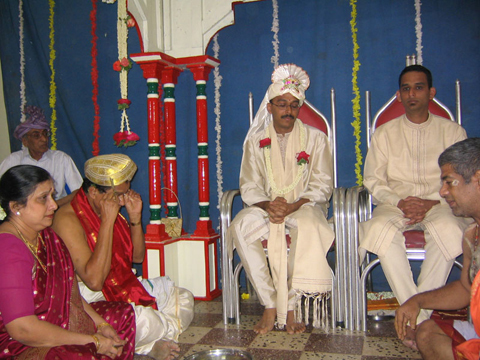 KanyaDaan - Giving away of the Bride In this ceremony, the bride is given away in marriage. 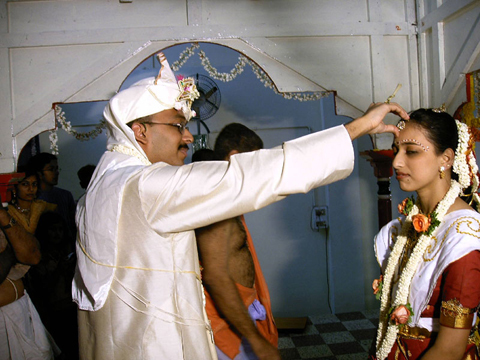 The bride's parents give their daughter as a divine offering to the groom to fullfill the obligations that are social, ethical and moral. 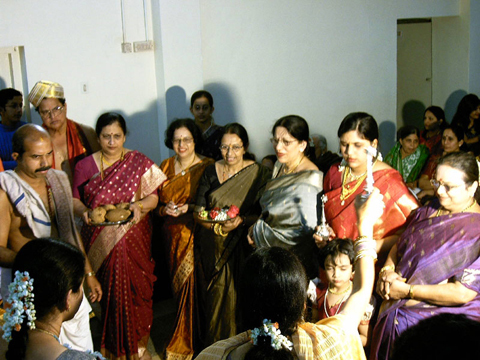 The bride's parents offer prayers to their Gurus and elders and seek their blessings. They wait for the auspicious moment, the Lagna Muhurtha which is predetermined by the priest. At this moment, the hands of the bride are placed over the groom. The bride's mother pours sanctified water and milk over the joined hands and that of the bride's father. The couple are advised to be strong and righteous and to show affection for each other's families. They accpet each other as companions for life and agree to live together most cordially and in perfect harmony. They pray that their hearts be blended and beat in unison. Anu's father placing her hand on mine. 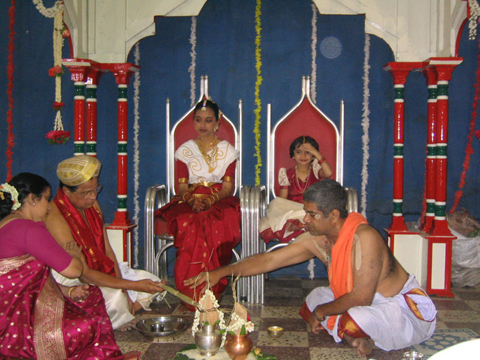 The bride applies Kumkum and Sandalwood paste to the 4 pillars of the Mantap and offers prayers. Next comes the wearing of the Dharemani , a black bead ornament by the bride. This ornament is considered very sacred by a married woman and she wears it throughout her life as a mark of her being married. Hymns from the Sri Suktha which is 5000 years old are recited before wearing this sacred ornament. 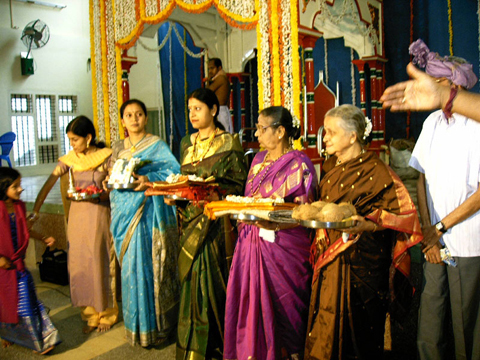 At the same time 2 head ornaments, Basinga and the Mangal Sutra and the marriage saree are worshipped. The bridegroom is tied with the Basinga and the Aarti is waved before him. He is then respectfully brought to the Mantapa.